Vegetarianism is perhaps the most important contribution Buddhism has made to Chinese cuisine.1 Today, Buddhist monks and nuns in China are expected to maintain a vegetarian diet, and as far one can tell, in general they take the prohibition seriously, abstaining from all forms of meat, fish, and eggs. There is more flexibility for the Buddhist laity in China. They are not required to be lifelong vegetarians and, while many are, some choose to keep to a semi-vegetarian diet, or adopt a vegetarian diet for a limited period of time. 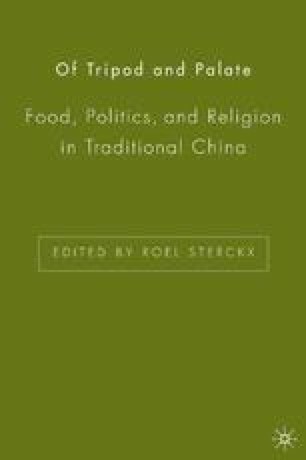 From at least the thirteenth century, the demands of a vegetarian Buddhist community have spawned vegetarian restaurants in Chinese cities and inspired the creation of a distinctive vegetarian cuisine, complete with various sorts of imitation meats as well as strict avoidance of alcohol, garlic, and onions—all linked to the avoidance of meat in Buddhist vegetarianism. Vegetarianism has in recent decades become a focus of attention among lay Chinese Buddhists, and the number of Buddhist vegetarian restaurants both in China and abroad has grown steadily, supported by a sizeable industry that manufactures vegetarian products. Buddhist vegetarianism has exerted influence on other religious movements in China as well, encouraging millions of Chinese to adopt a vegetarian diet on the basis of religious beliefs. For the moment, Buddhism is closely associated with vegetarianism in China and is an important part of Buddhist identity—monks, nuns, and to a lesser extent the laity daily affirm their beliefs and distinguish themselves from others by their diet.